In which sport has the University of Oregon won four consecutive national championships, and is favored to win its fifth this year? If you answered Acrobatics and Tumbling, you are correct! Competing under the National Collegiate Acrobatics and Tumbling Association, or NCATA, which is the national governing body for the sport on NCAA campuses, the Ducks have dominated the relatively new sport. Through the end of last year and since the NCATA’s inception just four seasons ago, the Ducks have an overall record of 43-3, 30 event titles, 11 All-America honors, and a coach of the year award, not to mention the four consecutive national titles. The 2015 UO softball season will be the final one at Howe Field as construction of a new stadium will take place on the site. Currently Oregon is ranked #2 in the country. Do you know which other University of Oregon team has been ranked #1 this season and is considered one of the favorites to win the 2015 NCAA Championship? Yes, that’s right. In good old rainy Eugene, Oregon, the Ducks have one of the most stellar golf programs in the entire United States! Similar thoughts can be echoed for this next team sport in which Oregon currently sits at #2 in the country behind #1 Florida, and ahead of #3 Michigan and #4 Alabama. Women’s Softball! Additionally, the Oregon Women’s Volleyball team finished its season last December ranked #12 in the national rankings! These are amazing accomplishments for our Duck teams. And I have not even mentioned, until now, our powerful Track and Field teams, where the men are ranked #2 and the women #5 for the indoor season, with the outdoor season about to get underway. 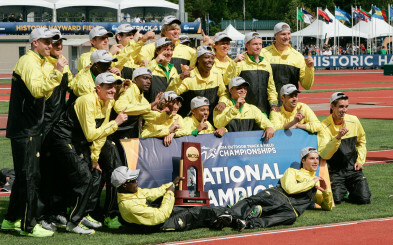 The 2014 National Track & Field Champions, the University of Oregon men, look to repeat in 2015. Also remember that we are just a little over two weeks away from knowing whether the Men’s Basketball team can play its way into the 2015 edition of “March Madness.” Not many gave this squad a chance to do so at the start of the season, but they are surging and playing very well of late. It is understood and accepted that football drives the bus in college sports at virtually every Power 5 Conference program. It grabs the most headlines and the most attention, with few exceptions…maybe Kentucky basketball for one. Football generates massive revenue, some of which is used to fund other university athletic teams and programs. While it is certainly easy to jump on the year-round football bandwagon, it is important to remember that University of Oregon athletics is not just about one sport. There are elite Duck athletes and teams in many other sports, as illustrated above. Those players and programs deserve our admiration and support. So take the opportunity to go to Matthew Knight Arena and watch Acrobatics & Tumbling, or head out to Howe Field (in its final year of use) for a women’s softball game. Make the drive over to Eugene Country Club to revel in the talent of the men’s golf team. 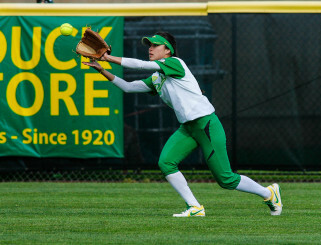 Who knows, you may just be watching a national championship team in action from our very own University of Oregon.